The increasing obsolescence of the PC couldn’t be more evident. Android, which runs almost exclusively on mobile devices, was installed on 60% of computing devices — including all PCs, tablets, and smartphones — shipped globally during the second quarter of 2013. That’s up from only 39% a year before. Android’s mobile-powered rise, and the decline of PC-linked platforms, becomes increasingly clear when we compare the recent fate of Android and Windows. One year ago, Windows held 34% market share next to Android’s 39%. Four quarters later, that small 5% gap has exploded to a massive 35% rift between the two platforms. The Windows market share has fallen to 24%. 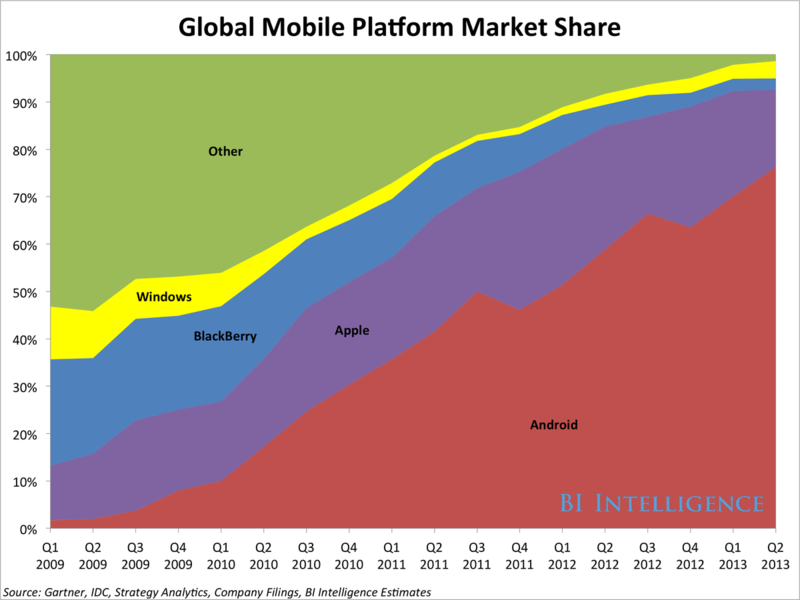 In a mobile-centric landscape, Windows remains tied to the moribund PC market. About 87% of Windows’s total unit sales last quarter were PCs. Meanwhile, tablet and smartphone-oriented Windows software simply hasn’t taken hold. Apple also lost global computing market share over the 12 months through the end of the second quarter. Its share dropped five percentage points to 14%. Apple’s slippage is due to competitive dynamics within the mobile industry itself. Android has been able to continue rising as a mobile platform, while Apple has clung to its strategy of selling high-end, premium devices and has lately succumbed to stasis. Over the last four quarters, Apple’s market share as a mobile platform has dropped from 26% to 16%. That’s due to losses in the smartphone and tablet markets. With no new iPhones in the first eight months of 2013, Android climbed to take a record 80% share of the smartphone platform market in the second quarter. On the tablet side, Apple has been unable to hold its own against the varied portfolio of fair quality, inexpensive Android tablets hitting the market. 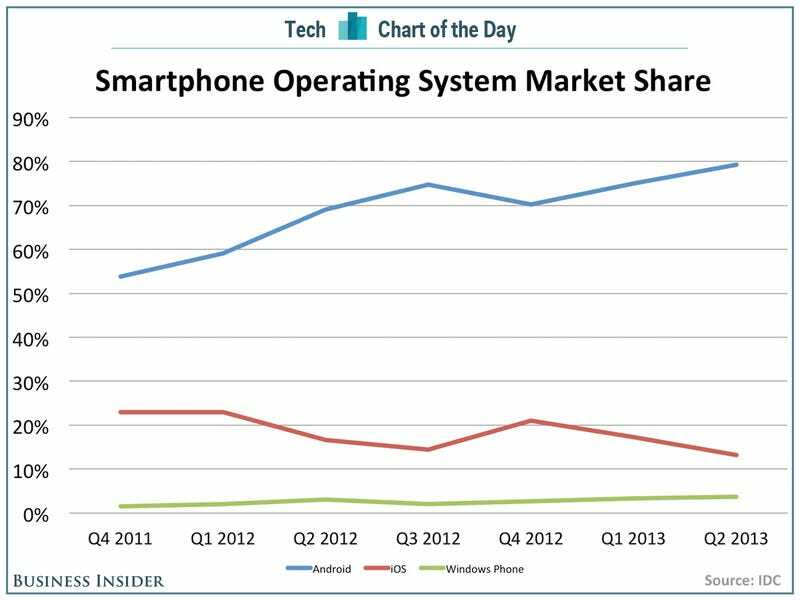 Android has a 64% share of that market. Microsoft is paying $7 billion for Nokia’s handset business. The two companies have been in a partnership since 2011. The first product of their partnership, the Nokia Lumia 900, was out in November of 2011. 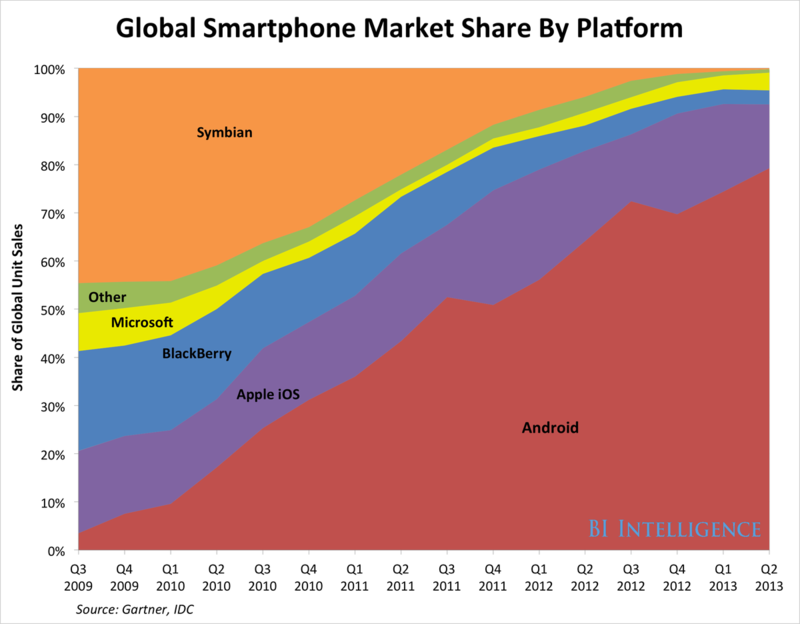 In this chart, you can see how Microsoft’s share of the smartphone market has fared since it released that phone. Microsoft remains stuck in a distant third with just 3.7% of the market, though it’s up from 1.5% when the Lumia launched. Microsoft reportedly acquired Nokia because it was unhappy with the partnership. CEO Steve Ballmer thought Microsoft needed to completely control the smartphone branding. He thought that Microsoft and Nokia were wasting energy with two marketing plans. Those might be problems, but really, they seem very small. The big problem for Microsoft is that its platform is at a disadvantage because it has fewer applications than Apple’s iOS or Google’s Android. It doesn’t offer anything that’s significantly better than those other platforms to make up for the lack of apps. Owning Nokia does nothing to change that. Here’s an alternative look at the data, showing full mobile display ad revenue figures and growth. In 2013, after the Jumptap acquisition, Google and Millennial Media will combine for over $700 million in U.S mobile display ad revenue. Updated global smartphone platform shipment numbers show that nearly 80% of the smartphones shipped during the last quarter run on Android. That’s a significant climb from just under 70% a year ago. 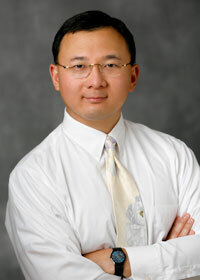 The strong jump can be attributed to the immediate success of Samsung’s flagship device, the Galaxy S4. But the predominantly Android-centric Chinese manufacturers — Huawei, ZTE, and Lenovo — also helped spur growth. Each manufacturer shipped around 11 million units last quarter, according to the latest data from IDC. The pace of Android’s expansion far exceeded Apple’s, resulting in Apple ceding six percentage points in market share year-over-year. It should be noted that no new Apple devices have been launched since September 2012. When the iPhone 5 launched, it helped boost quarterly shipments 23% year-over-year. 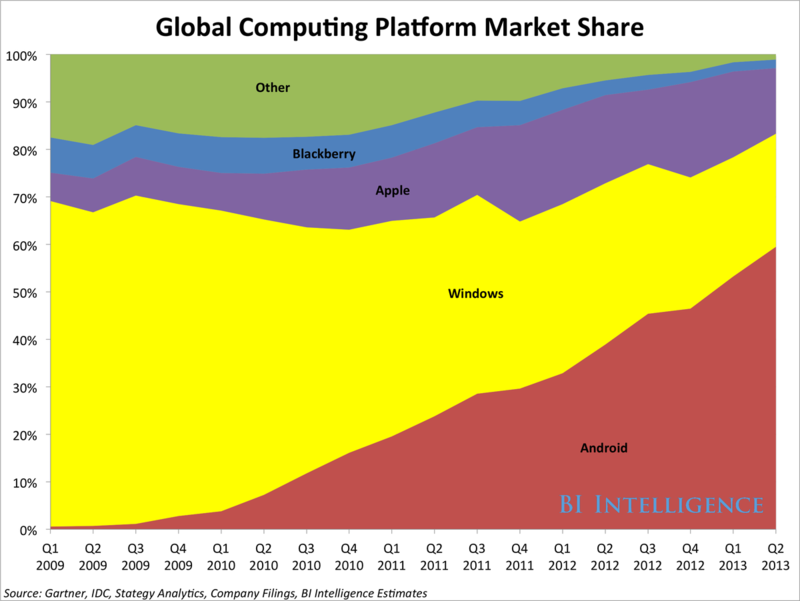 Android is not the only platform growing, however. Windows Phone grabbed a percentage point to reach 3.7% market share. It has firmly entrenched itself in third place in the smartphone wars. 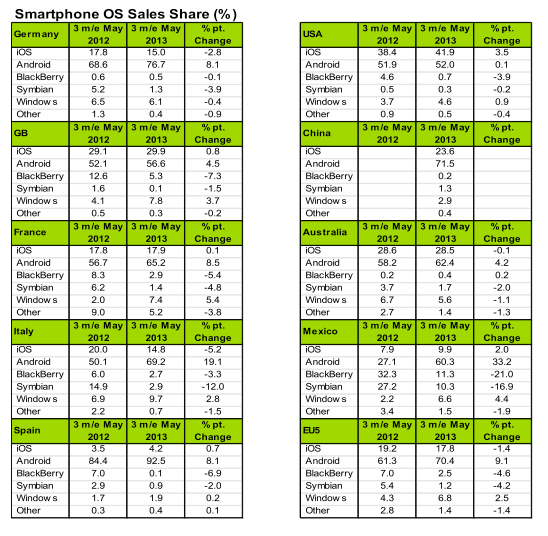 BlackBerry’s market share continues to decline, despite the release of its BlackBerry 10 OS. Here’s another look at the shipments data in volume terms. 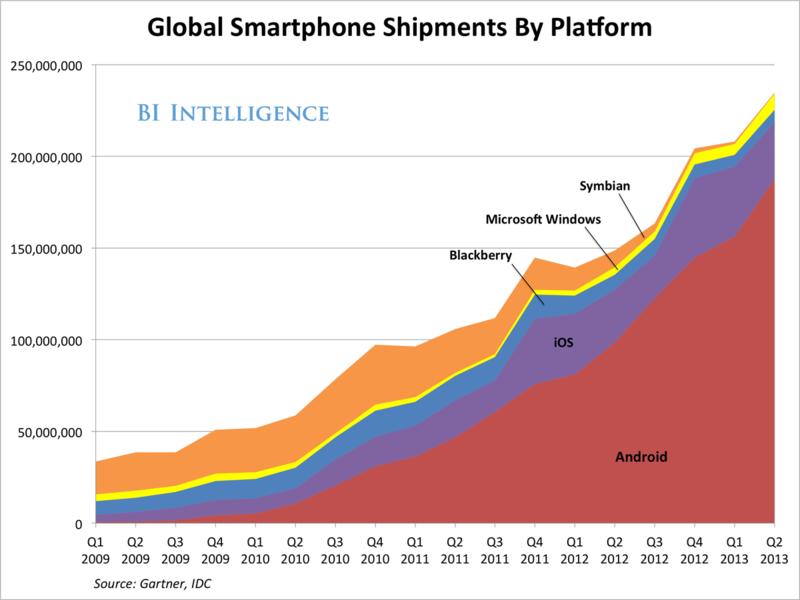 Android is dictating global smartphone market growth. 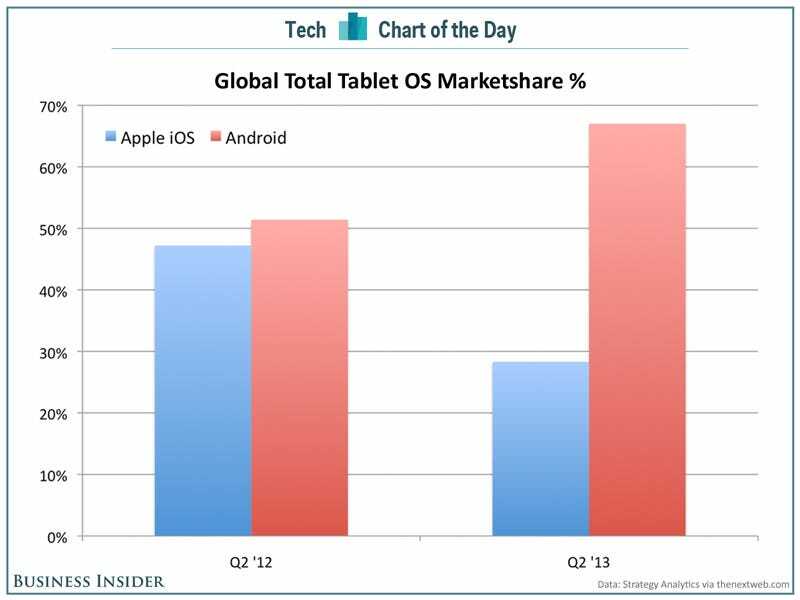 t appears Google’s Android is blowing past Apple not just in smartphone market share, but also tablet market share. According to Strategy Analytics, Android tablets now make up 67% of all devices in the category. Apple’s iOS, which powers the iPad, accounted for 28% of tablets. Other operating systems like Microsoft’s Windows 8 still barely register, but they’re gaining a little momentum. This mirrors what we’ve seen with smartphone operating systems. Since Google gives its Android OS away for free, manufacturers are able to pump out as many devices running it as they can. As a result, it’s pretty easy for Android to flood the market. But what’s really interesting is how the gap in tablet platform market share has widened over the past year. Here’s the breakdown. New research from Flurry confirms that Android does have the edge in active device market share, but iOS encourages app power usage. Flurry states that there were 564 million active Android devices globally at the end of April (versus 900 million total activations). However, despite the edge in market share, the average Android users only spend approximately 70% of the time in apps as an iOS user. No wonder most developers prefer to start projects for iOS. (See chart, above. There’s a reason Netflix accounts for almost one-third of North American peak downstream internet traffic. According to new data released by the NPD Group, TV programming accounts for 80% of subscription video-on-demand (SVOD) streams, and Netflix Watch Instantly dominates that market to the tune of 89% market share in Q1.